For months now, I’ve read commenters grumbling in anticipation of this week’s episode. I didn’t immediately remember “Pierrot Le Fou” based solely on its title or plot description. Mostly because the title’s allusion to the Godard film by the same name is obtuse and the episode’s plot is pretty negligible. So when I rewatched “Pierrot le Fou” today, I was hoping to be as impressed as a lot of people seem to have been by it and damn, was I. This week’s episode is a real treat, an episode so good that it really is in a class of its own. Mea culpa, commenters: you were oh so right. Like many of Cowboy Bebop’s highest highlights, “Pierrot Le Fou” is entirely reliant on mood and atmosphere. There’s a quality to a couple of key scenes that take the suffocating isolation surrounding the gangsters in Jean-Pierre Melville’s movies (esp. Le Samourai) and build tension to such a surreally heightened point that it feels like you’re watching a David Lynch-directed anime. Here, locations are expressions of internal conflict. In the first confrontation between Spike and Mad Pierrot, the comically obese, nigh-indestructible killer with a cruel half-grimace, half-smile on his face, you get the sense that you’re looking at a place designed specifically to accommodate two very different kinds of loners. But first, the plot: Mad Pierrot murders a group of people. Spike has the misfortune of seeing him do it. They then chase each other until one kills the other. Now, back to the action: the absurd and playfully improvised choreography of this opening fight scene is only heightened by the various little ways that episode director Takahiro Komori goes out of his way to give us a sense that there are stakes to Spike’s initial confrontation with Mad Pierrot. Close-ups, the use of incredibly harsh front-lighting and a stress on the stark sounds of gunshots, teeth grinding, grunting, even a cat yowling: all of these serve to bring us closer to the action. Just wait’ll you notice the ringing in Spike’s ears. This scene is also remarkable for the way that it’s set up. We see Spike in a pool hall, leisurely beating an anonymous opponent. It’s a very quiet moment; the “thok” of billiards balls impacting into each other is the most pronounced sound we hear. Spike’s in control of himself and his surroundings at this point. Meanwhile, Mad Pierrot is slaughtering a group of bodyguards and their charge somewhere nearby. We don’t know where exactly this is in relationship to Spike yet. Which is what makes the sudden appearance of Spike onto the street where Pierrot has executed his latest victim that much more jarring. You can can also actually visualize how intensely surreal this first accidental meeting is just from the way the two stumble onto each other. 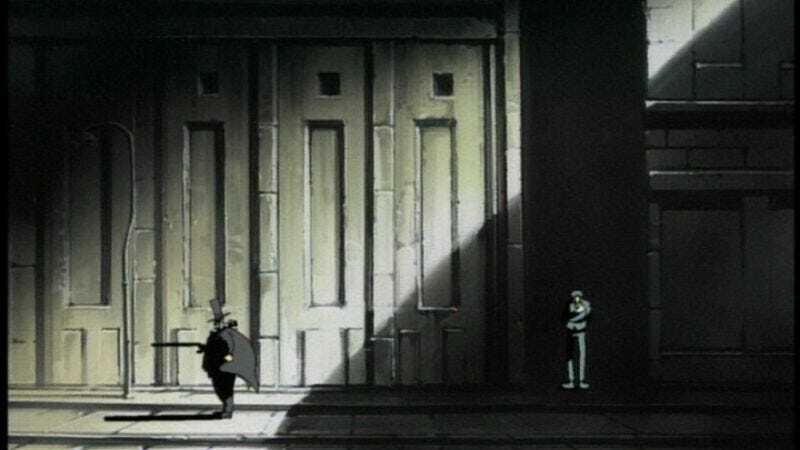 You see it in how small both Spike and Mad Pierrot are compared to the rest of the street they’re standing on, the way that shadows selectively envelop the wall of the building behind them, even the way that the two men are standing in relation to one another (Mad Pierrot is standing perpendicularly from Spike, his gun extended in front of him, while Spike has his hands in his pockets at the mouth of an alley). You get a wonderful sense of the personalities of all the locations used in “Pierrot le Fou” but especially of the street in this one scene. Without even realizing it, viewers are geographically immersed in the episode’s world. You hear pronounced footsteps on cobblestone steps and the dark corners of the streets as Spike dives into them to get away from his attacker (I get a weird The Elephant Man vibe from parts of this scene, especially because of the way Komori uses harsh, blinding white light to wash over otherwise desolate streets). The character of this street gives a distinct nightmarish identity to Mad Pierrot and Spike’s fight, making it one of the most exciting moments in the show. At least, it’s one of the most exciting moments until the rest of the episode unfolds. 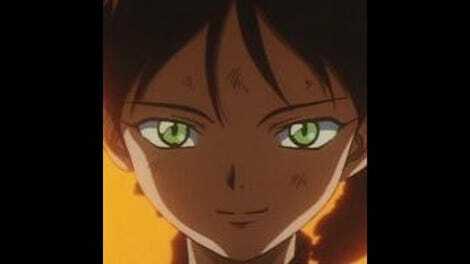 Another great moment is the sequence where we find out how Mad Pierrot became a killing machine and also why he behaves the way he does (“So he’s like a child with superhuman fighting abilities. Really. There is nothing as pure and cruel as children.”). During this flashback, you can see the walls closing in on and bending around Pierrot as he’s experimented on. You even get a sense of the incomprehensibly devastating nature of the chaos he leaves behind him when he escapes the secret facility he was held at. The trail of bodies, lain out like rag dolls on white backgrounds, is what happened. You don’t need to see how it happened, all you need to know is that it happened. Just seeing the bodies is frightening enough of an explanation. That having been said, the scene that probably best illustrates how locations take on a life of their own in “Pierrot Le Fou” is the one at Space Land, an abandoned theme park that Mad Pierrot confronts Spike at. The robot mascots that spring up and around the two as they fight are frightening because they’re just automated ghosts haunting an already creepy location. Spike jumps at shadows just as much as Mad Pierrot does (wind-up cat toys must die! ), and the park gets shot to hell. But it’s still standing by the end. It’s like we’ve tapped into a particularly vivid nightmare that Spike’s having, one that inevitably ends with Mad Pierrot’s death. When he screams, “Mommy, it hurts,” right before being trampled in the middle of a parade of robot mascots, it’s like you’re watching something intensely private that nobody but Spike could possibly believe without seeing it for themselves. “Pierrot Le Fou” is the standard that the show should be held up to because boy, is it good.